The Albatros D.Va was a formidable World War I fighter that was flown by Germany’s best-known pilots, earning them reputations as the world’s first aces. Several Albatros pilots went down in history. Manfred von Richthofen – “The Red Baron” – scored most of his 80 victories in an Albatros, not the red Fokker triplane he is often pictured flying. Herman Goering, who later led Adolf Hitler’s Luftwaffe in World War II, had 22 victories. Another German ace, Eduard Schleich, shot down 41 French aircraft in just one month flying an Albatros. It was easy to fly and deadly in combat. 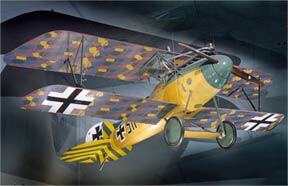 Over 2,500 Albatros D.Va aircraft were manufactured in Germany during WWI but, unfortunately, only 2 remain today. This Albatros, now in the permanent collection of the National Air and Space Museum, was built in Berlin, Germany, in 1918. During restoration by the Smithsonian, it was discovered that a bullet had damaged the aircraft. The bullet, which was probably caused during combat with an Allied fighter, traced a path over the pilot’s right ear, through the right-front machine gun mount, then through the fuel tank and coming to a stop in the engine’s right magneto. It was left unchanged during the restoration. The D.Va was powered by a 180hp Mercedes engine, giving it a top speed of 116 mph and weighed in at 1,399 pounds empty. While the fuselage was built of 3-ply birch plywood, the 29 foot wingspan was covered with linen fabric and painted in unusual colors . 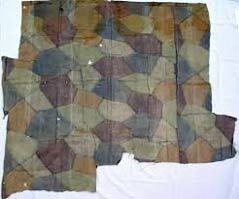 This German camouflage was named “lozenge” and had a geometric pattern with distinct lines. The colors were hand-brushed patches of green and reddish brown, or green and pale purple – in various shades. Unusual coloring as we know camouflage to be today. 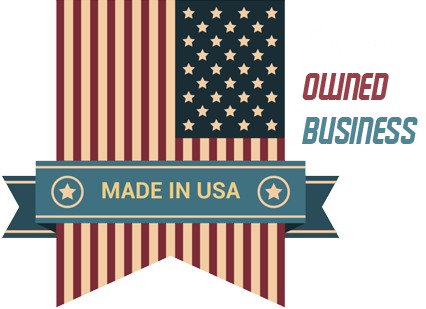 A 4-square inch swatch of the original wing fabric from the Albatros D.Va, preserved during its restoration by the Smithsonian, is attached to your 15″ x 20″ relic print. 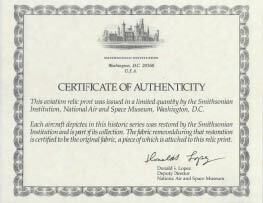 Also included is a Certificate of Authenticity signed by the Deputy-Director of the National Air and Space Museum as well as 2 pages of colorful historical information and the aircraft specs. A classic German fighter and a rare collectible – for anyone who appreciates aviation history or is a collector of World War I relics. 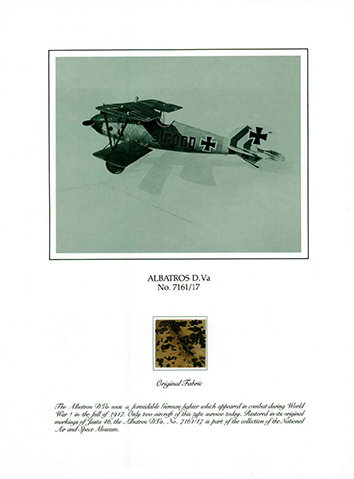 Our supply of the Albatros D.Va relic prints is limited to the fabric preserved when the aircraft was restored by the Smithsonian Institution. The Albatros DV.a is the perfect companion for another of our relic prints, the De Havilland DH-4 bomber, built in Dayton, Ohio. They were both front line aircraft as mortal adversaries and aerial combatants in World War I.